U.S. Defense Secretary Chuck Hagel and Russian Defense Minister Sergei Shoigu have agreed to resume talks on European missile-defense, which have been deadlocked since Washington refused to provide legal guarantees that the system under deployment would not target Russian forces of deterrence. Last week Russian Defense Minister Sergei Shoigu called U.S. Defense Secretary Hagel to congratulate him on his recent appointment and, during the conversation, proposed them to reconvene regular European missile-defense discussions at the deputy minister level. “In the course of the conversation, our minister stressed the need to resume the Russian-American dialogue on military issues and on matters of global and regional security — including the European missile-defense," Shoigu’s deputy Anatoly Antonov said. "We are very interested in how the situation surrounding the European missile-defense will develop, and our minister proposed reconvening regular consultations on this matter at deputy defense minister level: Anatoly Antonov from the Russian side and James Miller from the American side," he added. 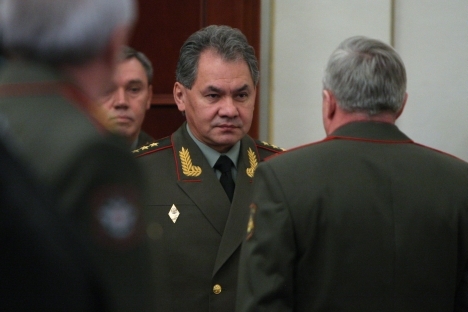 According to Antonov, Shoigu “expressed confidence that no interruption — let alone chaos — could be allowed to occur in the dialog between the defense agencies of the two great powers,” RIA Novosti reported. Pentagon Press Secretary George Little said the American side supported Shoigu’s proposal. “Minister Shoigu expressed his desire to reconvene missile-defense discussions with the U.S. at the deputy minister level. Secretary Hagel agreed and reiterated that this was an important part of U.S.-Russian relations,” Little is quoted as saying by RIA Novosti. Russia and NATO agreed to cooperate on the European missile-defense project at the Lisbon summit back in 2010. The United States’ plans to deploy a missile-defense system in Europe are currently one of the reasons for the tension in U.S.-Russia relations. The Pentagon has recently announced minor changes to its European missile-defense plans because of North Korea’s belligerent behavior, but those changes are purely technical and do not give reason for Russia to modify its position. Antonov further noted that Shoigu has reiterated his previously written invitation for his American colleague to take part in the international conference on European security, which will be held in May in Moscow. “The Russian minister also proposed taking advantage of this conference — to which defense ministers of all NATO member countries have been invited — to hold a Russian Federation-NATO Council meeting on its sidelines at the defense minister level. Such a meeting could take place in Moscow on May 24,” said Antonov. The deputy minister of defense added that the Russian Federation could tell those assembled at the meeting about the concept for its upcoming West-2013 strategic military exercises (which Russia believes NATO is worried about), as well as discuss matters of military cooperation between Russia and NATO. “Of course, an exchange of opinions on regional problems could also be held.” Antonov said. At the same time, Deputy Defense Minister Antonov expressed his personal opinion that the international conference on European security in Moscow on May 23–24 might be best time and place for a meeting between the two countries’ defense ministers. This article is based on materials from RIA Novosti and Vzglyad.